In 2010 the Derby Nomad Ramblers group decided to celebrate their 75th anniversary by planning a long-distance route around Derby on existing footpaths. The route is 50 miles and is waymarked with yellow and black markers. 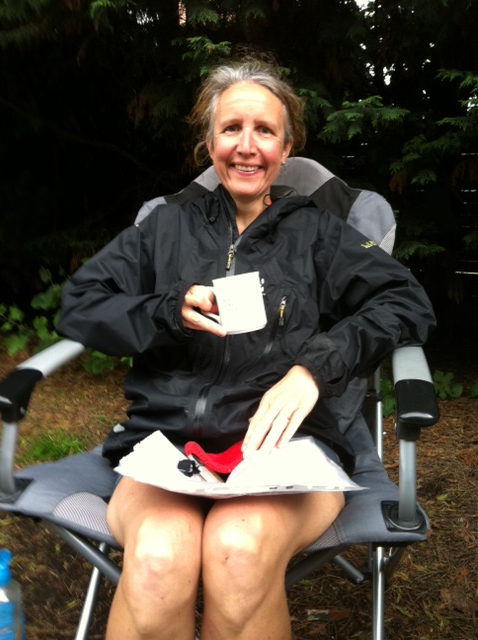 It formed the basis for Long Eaton Running Club’s 52 mile ultra race, which I completed in June – some of my orienteering club friends were doing the Footpath Relay on the same wet and windy Saturday! It’s only the 2nd year they’ve run the race and this year there were 25 finishers plus a handful of teams running it as a 6 leg relay – sadly not enough people on the course to reliably follow!! The route info was supplied as 50 strip photos from Google Earth and it took me 4 hours to stick these together on A1 card and transfer the route onto 8 bits of A4 1:2500! A marathon of Pritt Stick and highlighter pens! 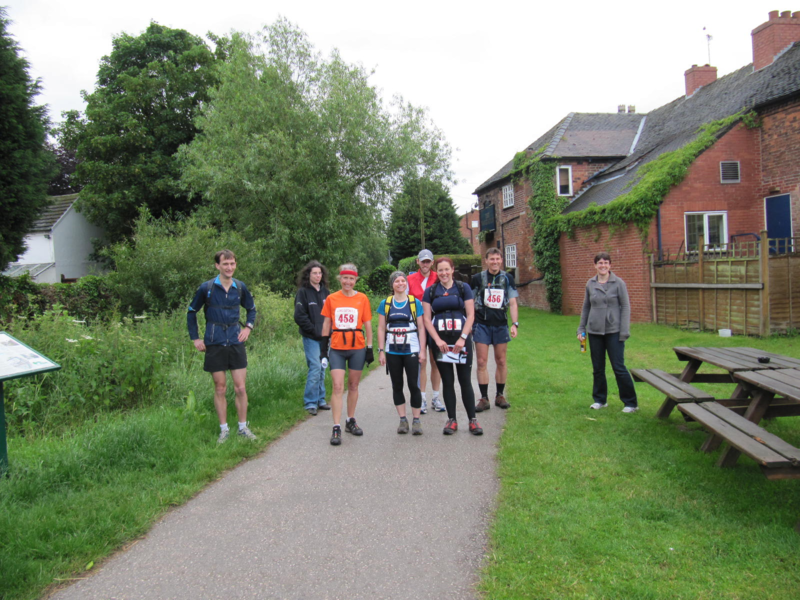 The Start was in Breaston near Long Eaton, from where it’s about 5 miles down to the Trent and Mersey Canal at Shardlow. I reccy-ed this bit and we had a nice afternoon out in Shradlow looking at the tiny Heritage Centre and the canal-side pubs. From there the route follows the canal to Findern, then up to Littleover and 2 ½ miles along the greenway towards Etwall. The next section (Dalbury to Kirk Langley) I decided to reccy and it’s a good thing I did as the vegetation was very high, hiding many of the way markers. In fact, I caved in and decided to take 6 sides of impenetrable route description with me on the real thing! After that, it was local territory from Kedleston to Duffield and Drum Hill. By Stanley Dale Abbey and Risley I figured I’d be walking anyway so navigating wouldn’t slow me down. We had all chosen start times between 6am and 7:30. I opted for 7 with 5 other runners so we set off from Breaston’s Navigation Inn in fine weather. The first checkpoint (12 miles) was a mile dogleg away from the canal at Chellaston and I got there in 1hr 52 having a welcome drink and some Jelly Babies. Checkpoint 2 is the Hollybrook Inn at Littleover and I got there at 10:25am. I ran with a Japanese runner who’d come up from London. He’d started at 6am so had lost a lot of time navigating. We walked most of the greenway to Etwall as it was raining and we were tired after 22 miles but then I got a 2nd wind and went ahead. I later heard he retired at Duffield. The next section via Dalbury was fiddly and slow (e.g. crossing wheat fields that hadn’t been trampled even tho’ a public footpath, hidden stiles) – but at least it stopped raining! Checkpoint 3 was the Bluebell Inn at Kirk Langley where Dave and Sarah were meeting me with coffee so I had a welcome sit down and a good feed! I’m lactose intolerant so I can’t eat any of the lovely cake they had at the checkpoints. Dave and Sarah ran with me in Quarndon then Dave met up with me again in Dale Abbey. I should have reccy-ed this bit as I missed the start of the path from the A6096 and ended up having to wade through chest high nettles and brambles after running along 3 sides of a field to join it. Lost me 15 mins! Dave found me soon after and we ran together to Checkpoint 5 the Carpenter’s Arms at Dale then Dave continued as navigator all the rest of the way, encouraging me to keep running up the hills. The last bit was lovely – a golf course north of Risley descending at the perfect gradient for tired legs, then what felt like a massive climb up the bridge over the A52, 4 more fields then home! 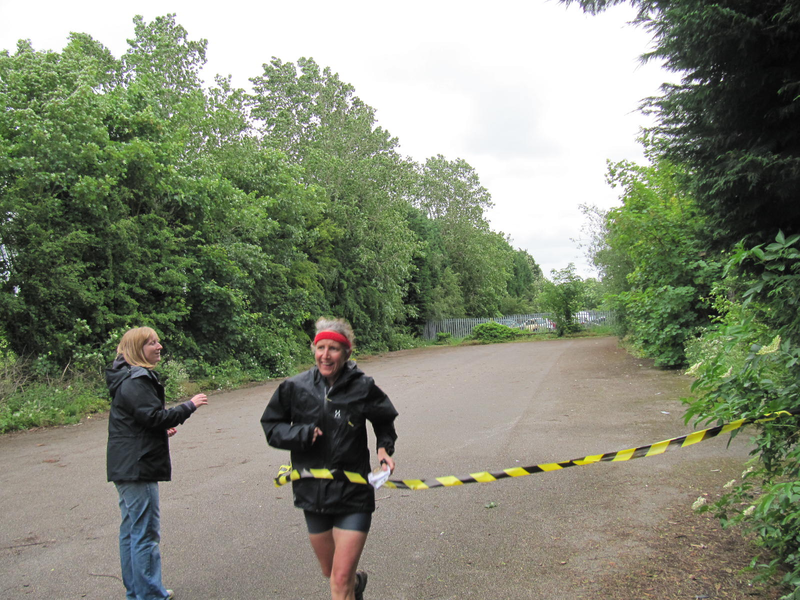 I was pleased with my time of 11 hours 3 mins, 25 mins behind the 1st lady. It was a really friendly race, the best £17 I’ve spent in a long time! The problems with navigating have made me resolved to reccy the London to Brighton Race at the end of September – it’s 57 miles and I don’t want to do any unnecessary ones! Even tho’ there are about 120 runners, I’ve heard it’s quite likely not to see anyone for 15 miles!